Argentina is the word. Argentina is the World. Here is the place for die-hard Argentina fans to follow the Albiceleste in every possible way! Videos, pictures, the latest scores, opinion, gossip, transfer rumours, a variety of sports and activities and anything that involves sports and Argentina will be our obsession. A new home for Mundo Albiceleste! You will find the usual features whilst there are some new additions and changes. I want to publicly thank our friend ZiggY who made it possible for us to have this new exciting place for Mundo Albiceleste. It's still pretty much a work in progress but we will keep improving and I'm sure you'll help us make it a better site every day. 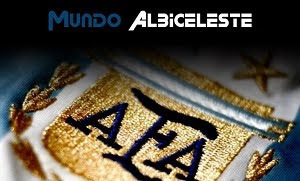 So, visit our new home at: www.mundoalbiceleste.com and lets continue with our undying support for the Albiceleste there. Now this is some surprise. Not only they are out of the World Cup, they we also leading inside 10 minutes (perfect scenario for a counter-attacking team like Brazil), but they also conceded two goals on set-pieces, which has been one of their main attributes. Holland are through and they now await for the winner between Uruguay and Ghana. I'm not going to go too crazy about this Brazil elimination. There is still a lot to play for and frankly, I posted it a few days ago, I wanted a dream final between Argentina and Brazil. It's not going to happen now and I hope at least Argentina play their part and make it there. I was trying to confirm this information that I know is of great importance for the superstitious among you and I heard it from the man himself: "We will wear our traditional Albiceleste shirt and Germany will surely be dressed in black" said Diego Armando MARADONA in an interview with Telenoche, the prime-time news journal of Canal 13 in Argentina. It remains to be seen whether we will also be wearing white shorts and white socks (a la v. Brazil in 1990 when CANIGGIA scored in Italy 1990 at the round of 16). Germany will wear their 'away' black kit. Why is this important for those who believe in external factors? Because we wore the Albiceleste when we won the 1986 World Cup against Germany (dressed in green back then) and we wore our blue away kit when we lost the final in 1990 and when they knocked us out four years ago in the quarter-finals. Thank goodness I didn't pay much attention to one of FOX Sports' 'experts' when two days ago he announced that it was going to be Argentina which had to use the away shirt according to FIFA rules. I don't know where he got that information from, but boy he was wrong and it was a good thing that I didn't post a thing about that back then. As for more important team news, MARADONA confirmed that Martín DEMICHELIS will start. He still needs to decide who's going to be his partner in central defence. It's going to be one of BURDISSO (he's got the upper hand because of his better fitness) and SAMUEL. He also said MESSI is fine and will be ready to play. SOS: It's the MESSI fever! I wish this meant something like MESSI-mania or similar. But unfortunately it has to do with what is going on with our number 10 and his health. Lio woke up with high temperature and didn't train today. Javier PASTORE replaced him in training exercises. DI MARIA started and so did Maxi and BURDISSO. VERON was out of that tested starting XI. Not good to hear. I guess we can only hope he gets better soon and is in great shape for Saturday. There is no way he is going to miss out on this game because of this fever. If it continues, he will still play. The only problem would be how much will this affect him. In the meantime, German captain, Philipp LAHM, said at a press conference that Argentine players are not known for being gracious in defeat. He then said: "We will see how they take it once we defeat them on Saturday". Two days without football in this World Cup, two German players having a go at Argentina. I take it as a good sign. They are probably nervous because they saw what the 'Chorizo vidente' predicted. The octopus was right! But what about this 'chorizo'? Time for a silly post and for a bit of fun. I read some of you were angry with Paul, the octopus, who keeps predicting Germany's results and so far has had a 100% record (including guessing their shocking defeat to Serbia). It's incredible how much publicity this octopus got. And here you can see him picking Germany for Saturday. And here at Mundo Albiceleste we have to admit he was right! (sorry, I couldn't find a link in English). So there you have it: Germany 3-1 Argentina. But wait a minute...wait a minute...there is another character who can predict the future and he has other things in mind. He comes from the land of the 'asado'. He comes from the land of Diego. 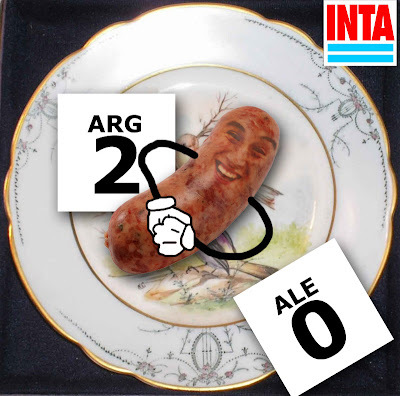 I give you...'El chorizo vidente' ('the future-telling chorizo') and he's got his own personal prediction for Saturday. What about this rumour? Will we play 3-4-3? I heard a rumour and I'm not a big fan of them, but seeing we have a tense wait before Saturday's match, I thought I'd drop it here and get some feedback from you. Apparently, Diego and members of his coaching staff have agreed in playing 3-4-3 v. Germany. Whilst I think it's risky to play with a backline of three after playing with four every game so far, I don't think this is such a crazy idea. We are talking about a 3-4-3 that could very well be considered as a 5-2-3 or 5-3-2 when we are under attack. How? Jonas and Clemente could drop back and become defenders. They would be out there covering ÖZIL and PODOLSKI and helping MASCHERANO in chasing MULLER or SCHWEINSTEIGER (if he joins their forwards), but they could also join in the attack when we have the ball. VERON would have a free role around MASCHERANO and would read the game to see what is needed from him at every moment. The three at the back will have to worry about Miroslav KLOSE and will have to help out Jonas and Clemente when they are one against two in coverage. I said it could be a 5-3-2 because I see TEVEZ dropping back a little bit if we are under real pressure. The 5-2-3 could show up if we are set out to counterattack Germany. An early 1-0 lead for Argentina would be the perfect scenario for this. With Jonas and Clemente not needing to surge forward that much and with VERON launching long passes for the three guys up front. Honestly, without even talking about the names, I don't think this would be such a crazy idea and I actually like it. You could think of Maxi or DI MARIA instead of Jonas and Clemente. You could have a case for BOLATTI or PASTORE instead of VERON. With this tactic and with the players we've got in South Africa, I think Jonas and Clemente would be better options than Maxi and DI MARIA. And I also think this could be a good chance for VERON to dictate the rhythm of the game and use all his experience. It could too much to give PASTORE his first start in such difficult conditions -even though I don't doubt PASTORE for a second, but the game is 90 minutes long -possibly 120- and he can still make an impact as a sub depending on how the game develops). It still pains me to be without Javier ZANETTI as this would have been a perfect game for him. And Esteban CAMBIASSO would have been perfect to do the same on the left. ZANETTI and CAMBIASSO instead of Jonas and Clemente and I'd be 100% sure of our victory. With their experience, their form and their ability to play as wing-backs and midfielders with the same level of peformances, it would have been just perfect to have them out there. Still, I think it's a good idea and I think it could give us the best possible chance to play Germany, probably be solid at the back, have a couple of holding midfielders (and one of them who could be a playmaker too) and all that without sacrificing none of our three forwards. Wow! That's a long analysis based on a crazy rumour! I'm sure you'll understand I can't think of anything else than this game on Saturday! Diego: "It would be a sin to change now"
I've been out all day and I've missed the live coverage (if there was any) of Argentina's training session or media activity. So I'm taking this information from the national media reporting on what Diego MARADONA said today. "I would be a sin to change now. Those matches we played against Uruguay (final week of the World Cup Qualifiers) and Germany (1-0 win in that friendly played in March in Munich) were tactically perfect. But right now, with different needs, the story is different. The truth is that we can't change the way we are playing now. It would be a sin to do that with the kind of players we have". "I don't have time to think about what Bastian SCHWEINSTEIGER said (Note: He said Argentine players like to provoke their rivals). My players are thinking of getting out there to the pitch and have revenge from 2006. So I don't care about what he says about penalty-kicks, about how we don't know how to accept defeat. We don't care about that. Each match is a whole new story and this will be no exception. We are going to attack them and we are going to play on their half. Maybe that's why they are so nervous". Diego showed his support to Martín DEMICHELIS and Angel DI MARIA. "Who says DEMICHELIS is playing badly? Whoever says that must be Andrea BOCELLI (Note: An Italian blind singer). DEMICHELIS is playing great. He is a top centre-back. And I'm very happy with DI MARIA. He is doing everything I ask of him and he can explode in any minute. His moment will come. It's in the air". After these comments, we still don't know what our starting XI will be, but we can pretty much know that we will go on and attack Germany. It also looks as if DEMICHELIS and DI MARIA will remain starters. We will know more about our probable lineup for Saturday when the team trains again on Thursday. So many things to write about! Where do I start? I'll start with an apology for not posting that much in the aftermath of our Mexico match. You know I wanted. I just couldn't. But here I am again to see if together we can ease some of the nervousness we are all feeling ahead of our clash with Germany. It's the late hours of Tuesday, 29 June and even though most of you will read this on the 30th, I can't ignore the fact that 24 years ago today, Argentina defeated West Germany 3-2 at the Azteca Stadium to win the 1986 Mexico World Cup. How many times have we watched those images and how many frustrations have we lived since then? 24 years later, it's Germany in our way again and we need to stop with this painful streak against them. It still hurts to remember how they beat us in the final in 1990 and how they eliminated us on penalties four years ago. It's time to stop them now. And what would be the best way to do so? Frankly, I'm not so sure. Do we try to beat them at their own game? Or do we try to play our way? Simple. Do we play with wide midfielders (Maxi, Jonas or DI MARIA for example) to run their dangerous offensive midfielders down the flanks and try to beat them at their game? With pace and power? Or do we play possession midfielders (VERON, BOLATTI, PASTORE plus MASCHERANO)? Both ways could work. Both could fail. I heard Jonas could be playing instead of DI MARIA and the rest of the team would be unchanged from our starting XI v. Mexico. I see then Maxi on the right (chasing Lukas PODOLSKI and helping Nicolás OTAMENDI) and Jonas on the left (going after Mesut ÖZIL and giving Gabriel HEINZE a hand). Thomas MULLER plays more of a free role and roams around the entire 3/4 when they attack, so I'm thinking MASCHERANO could be minding his runs. That formation and lineup would probably keep us covered at the back. I use the word 'probably' because with the talent Germany have (especially up front) you are never sure of cover for all of their weapons. They could be thinking the same, of course. That's the other matter. How will we attack them? MESSI, TEVEZ and HIGUAIN should all start, but if we really are playing with Maxi and Jonas together with MASCHERANO in midfield, my fear is: who would provide our three forwards with the ball? That's why I'm also thinking of the other option (not that MARADONA has it in mind -as far as I know-). What if we forget about what Germany do and concentrate on keeping the ball a la Spain and attack them instead? I know we won't get to the same level of beautiful passing game Spain have shown since even before they won the Euro 2008. But we could try to frustrate Germany by denying them of the chance to enjoy a lot of possession. I would be playing a fast RB like Clemente RODRIGUEZ instead of OTAMENDI (though I don't have a problem with the way Nicolás is playing, I would incline on using Clement because of his speed) and sticking with Gabriel HEINZE on the left (no, I'm not a fan of him overnight, but I have to give him credit for playing a very solid World Cup so far and I need my LB to defend exclusively if I'm going to use a midfield with more possession and attacking mentality). My two CB, by the way, would be Nicolás BURDISSO and Walter SAMUEL. I'm not trusting Martín DEMICHELIS so far. I'm sorry. In front of them, I would go with a combo of holding midfielders with MASCHERANO and Mario BOLATTI. Both could turn into defensive mode if we lose the ball and both could link up well with passing the ball around (especially BOLATTI). A little bit forward and just behind MESSI and TEVEZ, I'd use Javier PASTORE. He would create mis-matches all over the pitch for Germany. Playing together with MESSI and knowing that TEVEZ could drop back a little bit every now and then, our rivals wouldn't know who to mark and where to mark him. Yes, we could risk being a little exposed on the flanks, but if Germany attack us from the wings, BOLATTI and MASCHERANO could give some support to whoever needs it. Just the thought of thinking of the creative mind of PASTORE linking up with MESSI and both benefiting from TEVEZ's X-factor and HIGUAIN's movement, makes me dream of great things. That's why I keep asking myself. Do we play them at their game? Or do we play our traditional style? I don't know. I keep playing this game over and over in my head. It's killing me. How is this match developing in your brain and in your heart?